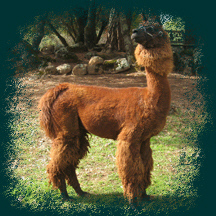 Corvo offered all of the qualities Argentine llamas are known for - Calm disposition, wool coverage, an outstanding topline & bone mass. Corvo has been under utilized as a Herdsire. His get include 4 full Argentine males and 3 full Argentine females (born 2010- 2013). His final full Argentine offspring was Sept. 2015. Corvo stood 40" at the withers. As with other Argentine imports, his get exceed his size. Fallen Oak has kept all of his female Full Argentine offspring.